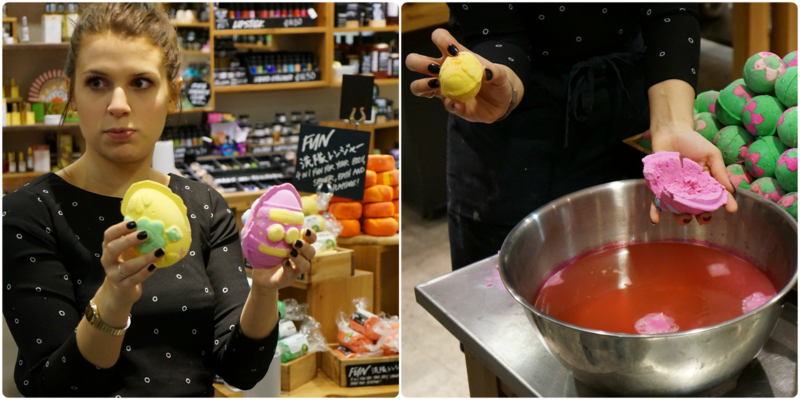 Yesterday morning I headed to Lush Meadowhall for the #LushBloggerBreakfast to have a sneak peak of the 2015 Easter range. 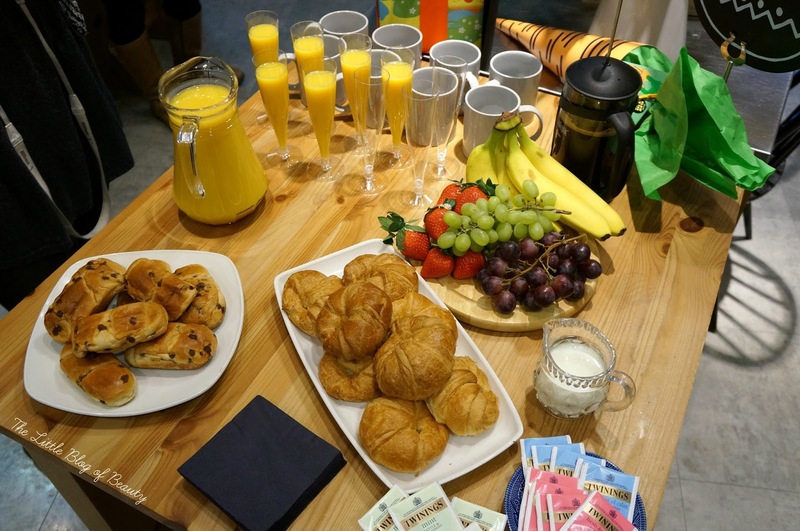 When we arrived we were greeted with a choice of tea, coffee and orange juice, as well as some croissants, chocolate brioche and fruit and a display of products including some old favourites and some new additions. 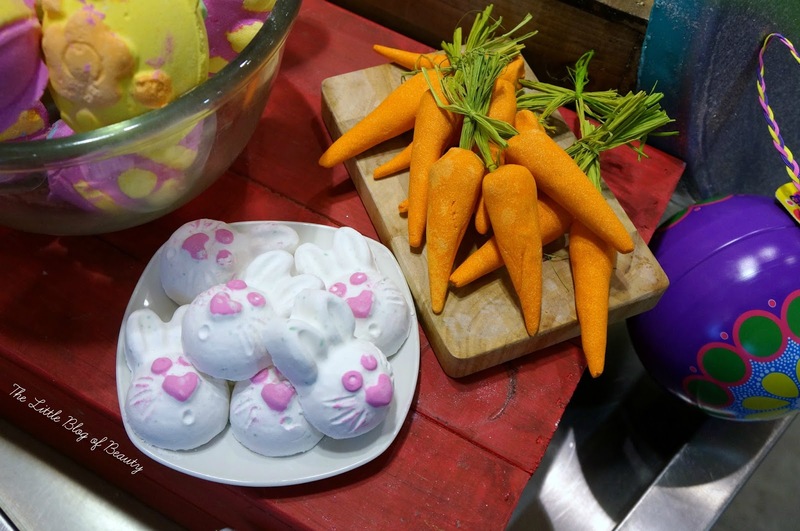 Let's start off with the Bunch of carrots bubble bar. This comes as a bunch of three carrots that contain buchu oil, lemon oil and bergamot oil. This is a reusable one so the idea is you swirl the carrots around in the water as you're running a bath and then leave them somewhere to dry ready to use next time. 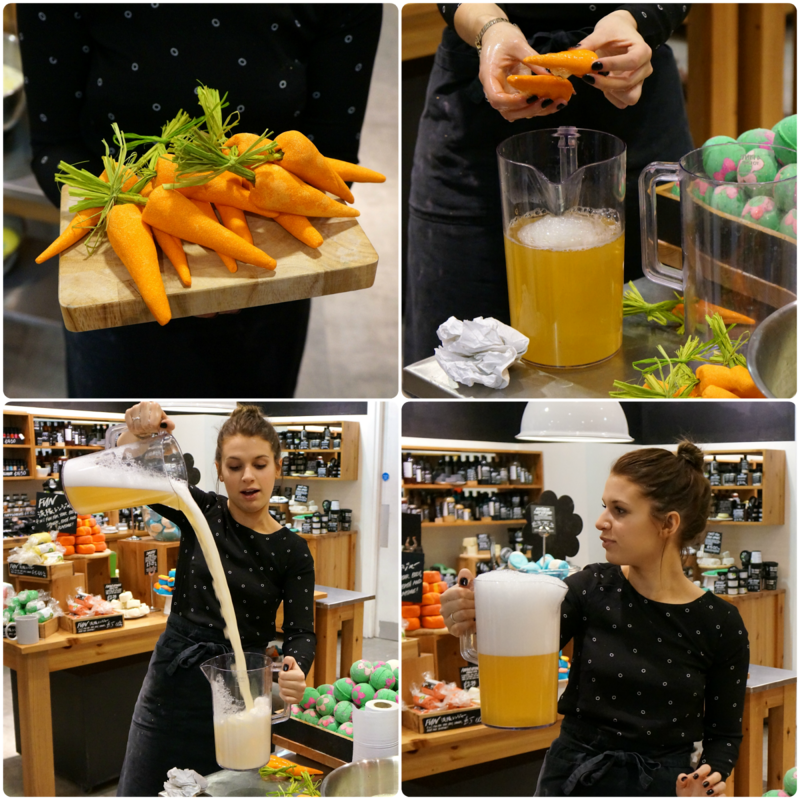 The two jugs were used to show that these produce an impressive amount of bubbles that feel very soft and silky. This may not be the prettiest of Lush's bubble bar products but I think it's quite quirky and is obviously Easter bunny appropriate. If you wanted to give somebody a slightly more unusual Easter present you could give them a chocolate bunny with a bunch of carrots (just make sure they realise the carrots aren't actually edible!). 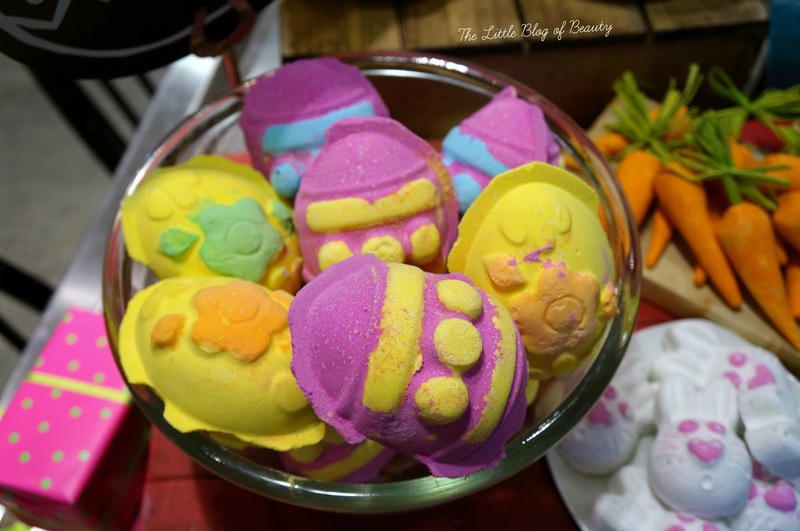 The bath bombs include Golden egg (not shown), Fluffy egg (the candy pink ones), Immaculate Eggception (the pink and yellow ones) and Hoppity Poppity (the bunny heads). I didn't get a good picture of Golden egg but I believe this is one Lush have released before. It's a small golden coloured egg covered in lots of glitter and containing Fair trade Colombian cocoa butter, olive oil and sweet wild orange oil. This one takes a long time to dissolve and leaves you with glittery yellow/gold water. I'm pretty sure that I've used Fluffy egg before so I think this one has also been released before. Snow fairy fans will be pleased to know this one smells like Snow fairy, so you can get your Christmas candy fix for Easter. Although I believe a few permanent products do at least smell similar to Snow fairy if not the same? Immaculate Eggception is a large bomb that is designed to be cracked open. Once in two halves (fingers crossed it doesn't crumble too much) you'll find a very cute little chick inside the egg and these pieces can then be used for three baths. I wouldn't advise chucking the whole thing in if you have the pink version of this one as we discovered the pink and yellow turns the water a rather unattractive muddy brown colour! This one includes grapefruit oil, lemon oil and fair trade vanilla absolute. I don't recognise Hoppity Poppity (what a cute name) so this might be a new one but I could be wrong about that. This contains violet leaf absolute, lime oil and popping candy to make your bath a little more fun. This one might be good for children as the popping candy will amuse them but I'd say it's perfect for big kids too. The soaps in the Easter collection are Somewhere over the rainbow, which contains mandarin, neroli and carnation, and Carrot containing buchu oil, carrot oil and Fair trade organic cocoa butter. Is it just me or does the Carrot look a little like a giant orange slug eating some grass? We didn't get to see it because it needed to be kept in one piece but running through the middle of the soap is the shape of a rabbit. 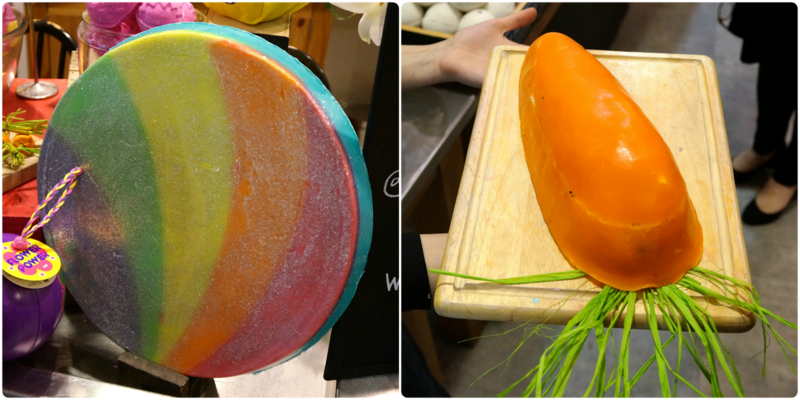 Somewhere over the rainbow is HUGE, I don't think I've ever seen a complete Lush soap that size before, and obviously the colour(s) of the bit you get will depend on where it's cut from. The sparkly gold flubber looking type thing is actually a shower jelly. I've tried a sample of a shower jelly before and they're quite strange to use. It's the sort of product you really have to try and get a good grip on (which is difficult because it's jelly!) or it will end up going astray. This one is Pot o' Gold, which contains fresh pineapple juice, Fair trade vanilla absolute and myrrh resinoid. This one smells like toffee, which is a scent I love, so I'm thinking about getting some of this. Finally Lush have several different Easter gift sets (I think there was around eight of them) but I'm afraid I can't remember the names of all of them (you can see some of the names above) and I'm not sure what's in each one. I think my favourite in terms of packaging is probably the carrot as it's just so quirky but the bunny one is also quite unusual. If you want to buy somebody something a little different for Easter, or just don't want to buy chocolate, one of these gift sets would be perfect. Lush very kindly gave me a Fluffy egg*, Immaculate Eggception* and Hoppity Poppity* to take away with me to try so reviews of each of these will pop up as I use them. I'm afraid I don't have any prices but the Easter range will arrive in store and online this Friday (27th February). Will you be treating yourself to anything from the Easter range? 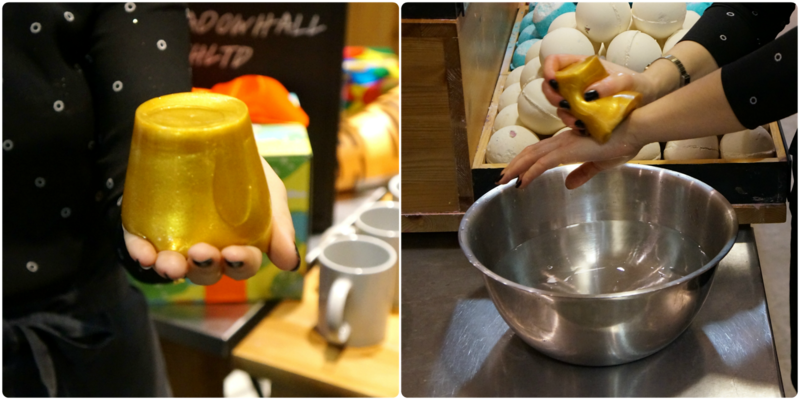 I love lush so will definitely be purchasing some of their Easter collection! I particularly love the look of fluffy egg bath bombs. Lovely post! Lush always manage to impress me with their seasonal releases. Can't wait to try some of these. Awh all of these look really cute! I always get so overwhelmed when I go into a Lush shop, there's so much choice and I have no idea what to get, so generally walk in and walk out. I think I'll definitely try out some of these though (hoppity poppity purely for the name), since the seasonal ranges are always adorable! These all look lovely! 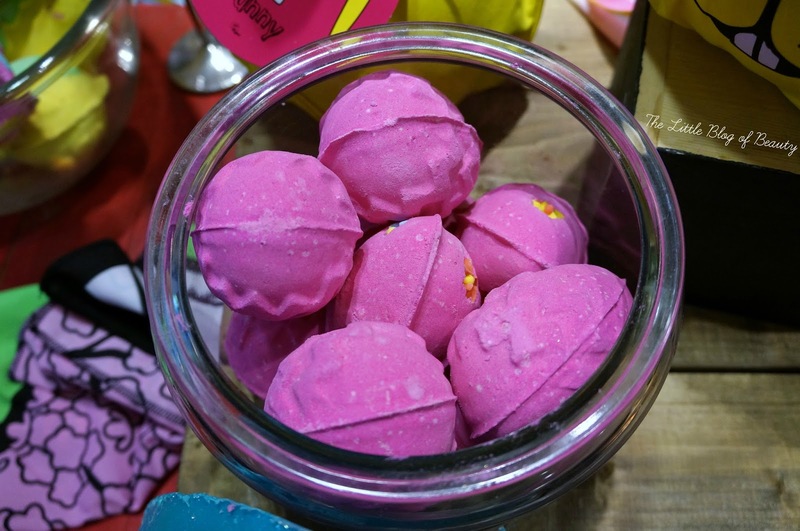 I'm glad the Bunch Of Carrots Bubble Bar is back - that's one of my absolute favourites. 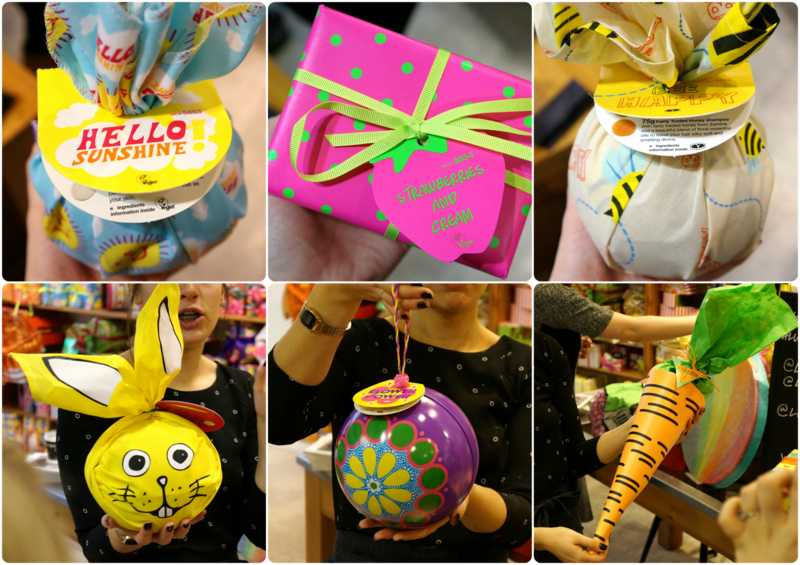 Ive never tried anything from Lush which is like the ultimate blogger sin, but your photos look amazing and I'm really impressed with the bits they've got for easter! those carrots are the cutest!